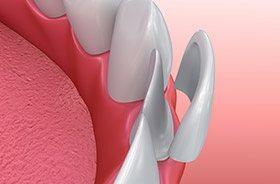 While traditional porcelain veneers are an excellent method for correcting many cosmetic smile flaws at once, patients should keep in mind that they do require some of the natural tooth enamel to be buffed away to accommodate their placement. This means that veneers are essentially a permanent procedure. However, Torrington Dental Care now offers a more conservative alternative – no-prep veneers. Our dentists can use Lumineers to help patients achieve the brighter, happier teeth they dream of in a minimally invasive fashion. Why Choose Torrington Dental Care for No-Prep Veneers? How Do No-Prep Veneers Work? Like traditional veneers, no-prep veneers are still directly bonded to the front surfaces of requested teeth to change their size, shape, and/or color. However, this type of veneer has the width of a contact lens and does not require a large amount of the enamel to be removed. In fact, many cases don’t require ANY reduction at all, while others may need a negligible amount to achieve optimal results. Additionally, no-prep veneers can be reversed in most cases if a patient ever chooses to return to their natural smile. 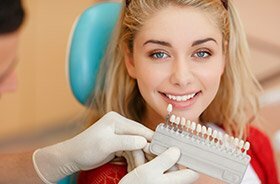 Are No-Prep Veneers Right for Me? While no-prep veneers/Lumineers eliminate the removal of natural dental structure, some patients feel that they do not have the same level of lifelike quality that traditional veneers do. It is ultimately up to a patient to decide which option best fits their specific goals and preferences, and our team will be happy to provide all of the guidance you need in order to make this decision as straightforward as possible. We want to do what is best for you here in Torrington, CT! Feel free to contact our dental office if you would like to discuss the matter directly with our team.